Adding a new twist to this year's game, ESPN will be televising Penn State's spring scrimmage game! The April 24 Blue White game will air on ESPN2 at 2:00pm EST. While other schools have had their spring games televised on ESPN, Penn State is the first Big Ten school. An Award by Any Other Name: Joseph V Paterno Award Announced. The Maxwell Club of Philadelphia has announced that they will be creating the Joseph V Paterno Award for coaching. 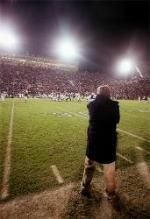 The award will be given, annually, to the football coach who has the greatest impact on his team, community and school - or something like that. The Maxwell Club also sponsors the Bednarik and Maxwell (cheeky) Awards. I wonder who will win the first JoePa? JoePa? Cheese Glorious Cheese; Only 53 days until Blue White! SCREAM!!! It's less than 2 months until Blue White! We are seriously behind in our food planning/preparations - okay, maybe not seriously behind - but it's definitely time to break out the "freezes beautifully" recipes and get to work! One such recipe is one for gougeres (rhymes with "oooh Cher!" not "booger") - cheesy cream puffs (minus the cream) really. Traditionally, you use gruyere cheese when making these - but I had some Mimolette cheese (yay Trader Joes!) - so I used that (a substitution I have, successfully, made before) and some Pecorino Romano. Generally, you want to use a hard, somewhat pungent cheese - to counterbalance the eggy richness of the choux paste (okay that's the last of the french - I promise, maybe). ANYWAY - these little critters freeze, you guessed it, beautifully and are easily re-crisped in the oven after thawing. Add milk and butter to a heavy bottomed sauce pan. Heat until butter is fully melted. Add flour - stir (with wooden spoon) vigorously 1-2 minutes. Return pan to heat - stir another 1 (or so) minute - until light film appears on bottom of pan. Remove from heat - allow to cool 10 - 15 minutes (this is a good time to grate the cheese). Once dough is cooler add eggs - ONE at a time - stirring each egg until fully incorporated. Add 3/4 cup grated cheese - or however much you want - stir. Drop spoonfuls of dough onto a parchment lined baking sheet - leave 1"-2" between each. With a pastry brush, brush each gougere with milk and top with reserved grated cheese. Bake, ONE sheet at a time, for 20 minutes. After cooling, I stored these in ziptop bags and threw them in the freezer - I'll see you in April! And, since the first rule of good cooking is to taste - I set aside a few cheese puffs to have with dinner. They're a Winning Combine Nation! 4 Penn Staters Workout at the NFL Combine. It's the first day of defense drills at the NFL Combine. Our fine friends, Jared Odrick (DL), Sean Lee (LB), Navorro Bowman (LB) and Josh (the Stache) Hull (LB) all workout today. Odrick and Bowman are both on (most of) the experts' lists as top draft picks - and, surprise, surprise, they are both actually going through the drills. Believe it or not, Lee and Bowman posted the same time (4.72 - unofficially) for the 40 yard dash - It would seem that the knees are doing well. Bowman was a top performer in the benchpress with 26 reps.
NFL.com is really a great resource for checking out the action. Penn State concludes it's participation today.